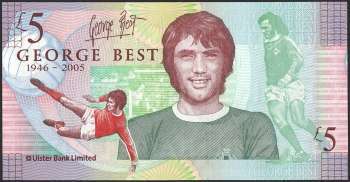 The Ulster Bank limited edition £5 notes is a tribute to the Manchester United footballing genius marking the first anniversary of his death. 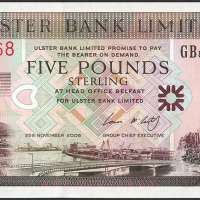 The notes was available for purchase at any Ulster Bank branch in Northern Ireland from 27 November 2006. The first of the million genuine printed £5 notes GB0000001 was given to Barbara McNarry, one of Best's sisters. 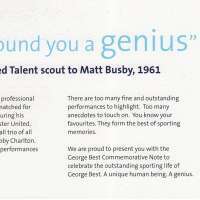 The note GB1000000 was handed to the late player's father Dickie Best. 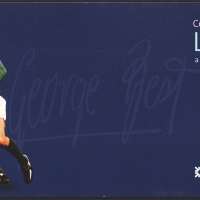 Signature: Cormac McCarthy, Group Chief Executive. 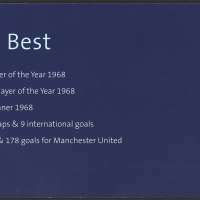 George Best passed away at age 59 due to multiple organ failure following decades of alcohol abuse.